‘Frontier Wars (Flying Fox Story Place)’ 2014 is a collaborative work by Sydney based artist Tony Albert and Aurukun based Alair Pambegan. 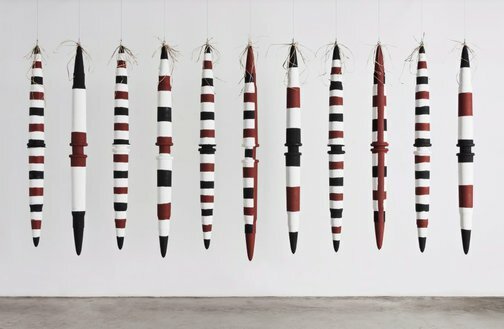 Their families have had a close relationship since 2002, when Albert and Pambegan’s father, Arthur Koo-ekka Pambegan Jnr were involved in a significant exhibition of Indigenous Cape York artists. 'Frontier Wars (Flying Fox Story Place)’ 2014 comments on the colonial wars that have taken place in Australia, as Indigenous people defiantly defended country. This work draws upon the ancestral histories of the Winichiam clan, of which Pambegan is a member. His family has responsability for Kalben, the location that relates to the flying fox. 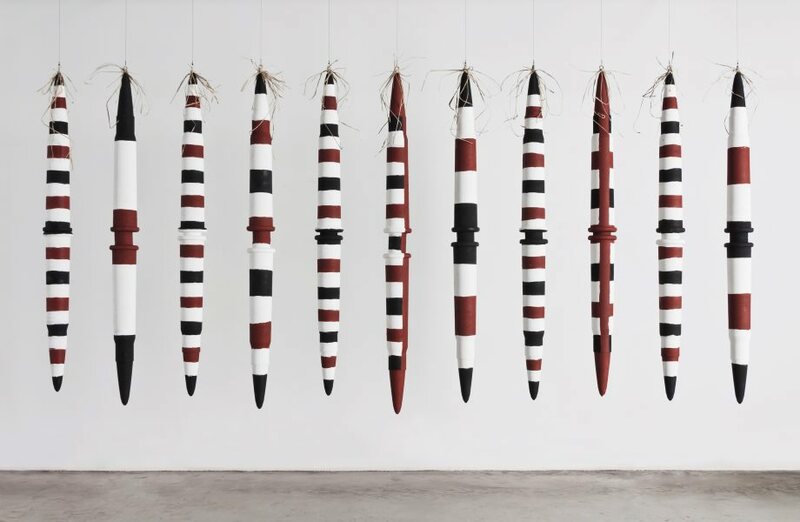 This work is strongly influenced by Albert’s ‘Yininmadyemi Thou didst let fall’ 2015, the public art work for the City of Sydney’s Eora Journey in Hyde Park, which memorialises and honours Aboriginal and Torres Strait Islander men and women who have served their country. ‘Frontier Wars (Flying Fox Story Place)’ 2014 is a graphic reminder that the lands upon which these wars were waged were owned, remembered and cared for by traditional owners since before time in memorial. Cara Pinchbeck, Look , 'When silence falls', pg. 24-26, Sydney, Dec 2015-Jan 2016, 24 (colour illus. ), 25, 26.